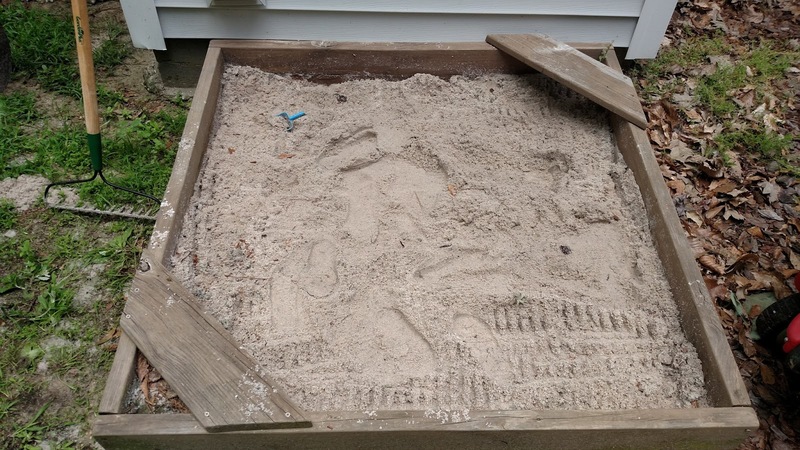 We have a sandbox in our backyard that my father-in-law made my children. It was popular for a number of years but has been neglected recently as they have grown out of that stage in our lives. But I wasn't sure what to do with it. It is a sacred space for us and I was afraid to change it. 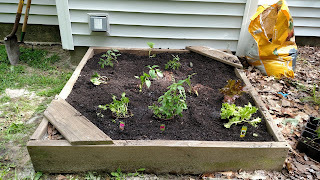 I have also wanted a vegetable garden but was overwhelmed with the thought of digging up part of our yard to create one or build a raised bed. I am not known for a green thumb as much as my mom has tried. I looked at the sandbox with new eyes and decided we were going to make our sandbox into our new garden! My daughter has been very into plants since they grew seeds in her classroom this spring. My mother-in-law loved the idea so we made the plan of what we wanted to grow and got busy this morning. 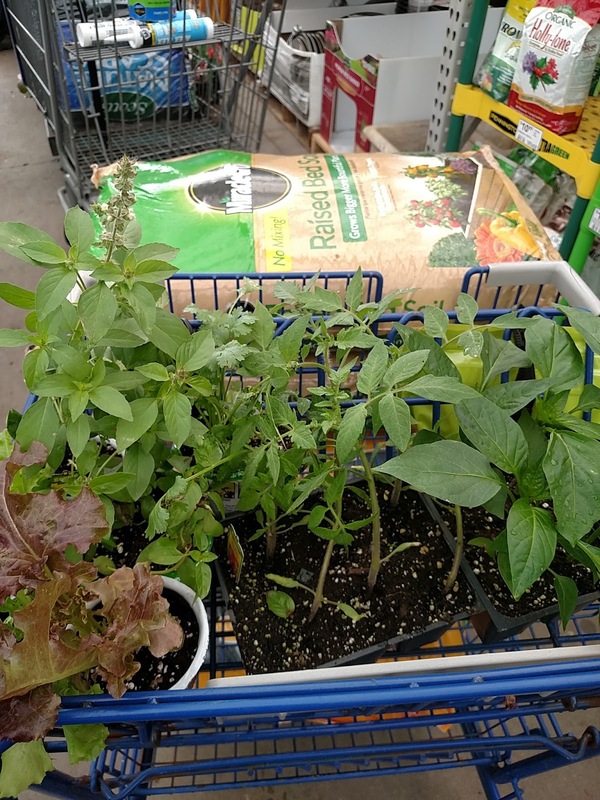 A cart full of new life! 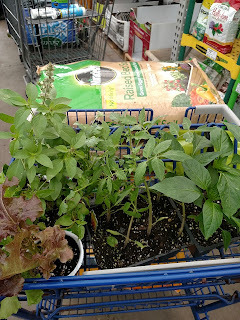 I headed off to Lowe's and bought soil, cilantro, basil, peppers, lettuce, tomatoes and zucchini. In an hour and a half, we dug and planted and watered and got super dirty and created new life in our sandbox that earlier that morning had only had a broken shovel and a golf ball in it. In a few weeks, we will have food that we can eat and herbs to season our meals. My kids will get to taste how amazing food straight from the soil is especially when you plant it yourself. So what is your sandbox? What is the sacred space in your church that no one is using but everyone is afraid to change because it was given in memory of somewhere or everyone knows it by a special name and cherishes the memories. It is Easter. We celebrate it for 50 days in The Episcopal Church but resurrection can happen anytime and anywhere. Can't wait to watch it grow! - Can your library get some comfy chairs and floor space and become a mothers morning out room? And they might realize that there are kids books in there that they can borrow. - Can the bride's room become a space you open to the neighborhood as a job center to get resume help or computers for them to apply for jobs? - Can the acres of land behind your church become a garden to grow food for the local food pantry or space for bees? What are some of the spaces in your life or church that can be repurposed? Your blog is awesome. You have shared very valuable information to us. Thank you so much for sharing this. Nice article. I really enjoyed your story about sacred sandbox.If you want to connect with christian community, then we help you in Connecting Christians Around The World.